Climb the Lighthouse tower's 88 steps to the top! See panoramic views of the island! 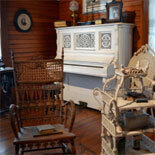 Experience the early 19th century life of the Lighthouse Keepers! 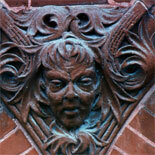 See the folk-art sculptures of Stanley Papio! Presented by the Key West Art & Historical Society, the Lighthouse, Fort East Martello and Trolley Tour Package takes you on a 90 min narrated history tour of Key West. Step back in time and experience the life of the Lighthouse Keeper through the families who kept the light burning from 1826-1969. See personal affects, diaries, artifacts. View a 12 foot, first-order, Fresnel lens circa 1858. Climb 88 steps to the top for a panoramic view of the island and surrounding waters. 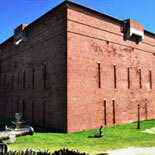 In this brick fortress constructed in 1862, explore the preserved battlement's collection of relics from the Civil War, learn about the wrecking and cigar-manufacturing industries, view the unique folk art of Mario Sanchez and metal sculptures of Stanley Papio, as well as meet the Ghosts of East Martello, including the infamous Robert the Doll! Sit back while expert tour guides turn back the pages of history to the days of Indians, pirates, wreckers and the Civil War. 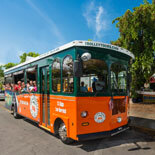 Old Town Trolley Tours of Key West is the best way to explore the southernmost city.and her history. 90 min sightseeing tour with 9 stops to hop on and off at sites that interest you. Find out where you want to shop, dine, or explore on your visit to Key West. For a fabulous ride through the pages of history, get your eTickets now for the Lighthouse, Fort East Martello and Trolley Tour Package! Doors open at 9:30 am with last admission at 4:30 pm. Open daily, closed Christmas. Trolley hours: Daily. 9:00 am to 4:30 pm 363 days a year. Closes at 1:00pm on last Friday and Sat in October for Fantasy Fest. No Use Date is required. Tours depart from boarding locations approx. every 30 minutes. Reservations are not accepted and seating is on a first come first served basis. Patrons with etickets (voucher) can board at any Old Town Trolley boarding location. Without an e-Ticket voucher you must go to the ticket booth location with invoice order number. Parking is available at Mallory Square and The Westin Parking garage. When purchasing eTickets for groups of 20 or more, please call Customer Service so that we may most effectively serve your needs.